Eprex Injection distributors, dealers & suppliers in Mumbai, India. 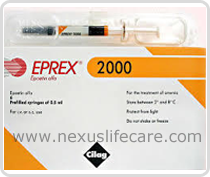 Uses:- Eprex Injection is used to treat the anaemia associated with kidney disease. Eprex Injection stimulates bone marrow to produce more red blood cells, helping to treat anaemia. Side Effects:- Flu-like symptoms such as dizziness, drowsiness, fever, chills, headache, muscle and joint pain and weakness.